Crepes are essentially dairy, eggs, and gluten all rolled up into one. So many might hesitate to attempt a top allergen-free version. But Charmaine at Yummy Allergen Free had some serious crepe cravings. And after numerous trials she accomplished gluten-free dairy-free crepes that are also egg-free and sugar-free! If you have never made crepes before the swirling motion may take a little practice. There is the old saying “the first crepe is for the dog”, which pretty much means your first crepe is just for practice. Put the egg replacer (or eggs), milk beverage, water, buttery spread, flours, starches, and salt in your blender. Blend until smooth, about 2 minutes, stopping to scrape down the sides as needed. Preheat a heavy duty Teflon-coated, 8-inch omelet pan over medium-high heat. Make sure the pan is fully preheated or the first crepe won’t brown. Oil a paper towel and use it to evenly grease the pan. Pour ¼ cup batter into the preheated pan, then lift the pan off of the heat and swirl it until the bottom is covered and the batter has stopped flowing. Set the pan back on the heat and cook for about 1 minute, or until the edges are all curled up away from the pan and the bottom has browned a bit. Gently flip the crepe over and brown the other side for about 1 minute. Remove the crepe from the pan and lay it on a piece of plastic wrap or parchment paper. Re-oil the paper towel, as needed, and use it to oil the pan between crepes. 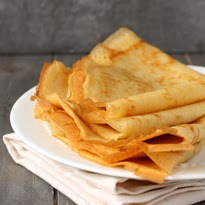 Also, layer the cooked crepes with the plastic wrap or parchment paper to keep them soft and to prevent them from sticking to each other. Place the strawberries water and sugar in a bowl. Stir until the sugar is dissolved and a light syrup forms. Alternatively, you can cook them together over medium heat for a few minutes to help the strawberries break down. Put the apples in a pot with just enough water to cover. Add the sugar and a dash of cinnamon. Bring the water to a boil. Reduce the heat to low and cook, stirring occasionally, until most of the water is gone and apples are tender. Melt the buttery spread in a pot over medium heat. Add the sweet rice flour, and cook while stirring for 3 minutes (it will look grainy). Add a little of the broth at a time, whisking thoroughly with each addition, until all of the broth is added and the sauce is smooth and creamy. Stir in the chicken and broccoli and cook until heated through. 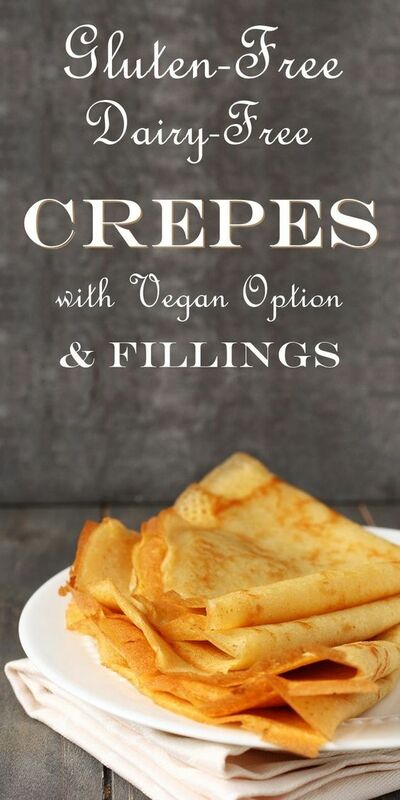 0 Response to "Gluten-Free Dairy-Free Crepes (Egg-Free too!)"